Introduced by U-Reach in CES 2012, the Intelligent 9 USB Series is a standalone USB flash duplicator that packed sophisticated features into a small footprint (about 40% the size of a tower with the same target count). Its ability to clone external USB HDDs/SSDs is what we’d like to focus on here, for other features and more details about the Intelligent 9 USB duplicator, please visit ureach-usa.com. Unlike most USB flash drives, HDDs usually consist of multiple partitions and thus making it more challenging to analyze data stored. To ensure accurate cloning of USB HDDs, an “external HDD mode” is available and has to be activated on the Intelligent 9 USB duplicator. Furthermore, external USB HDDs consume more power than USB drives during operations (which is why you might see some external HDDs bundled with dual USB connectors to draw power); therefore, if a job requires copying USB HDDs, the Intelligent 9 USB duplicator can be hooked up with additional power adapters to cope with increased power consumption. 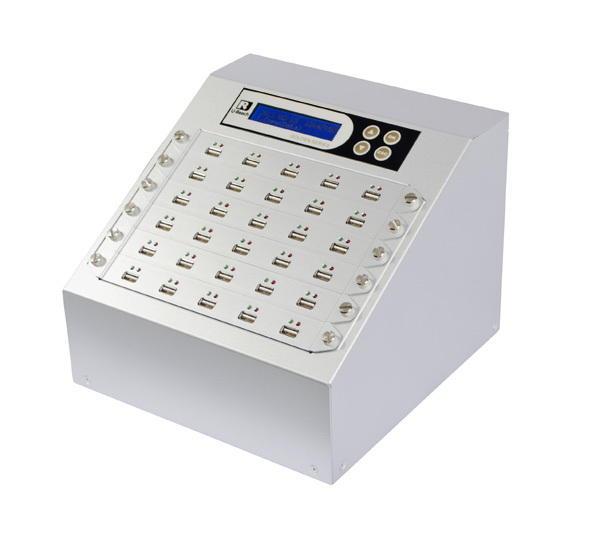 Different from other solutions which provide USB HDDs cloning as an afterthought, the Intelligent 9 USB duplicator is well designed to accommodate extra power connectors at the back of the unit. Take the 30-port model UB930S for example, two power adapters will be adequate for cloning 29 units of external USB HDDs.